Greece is full of ancient wonder, with myths and legends centred on its well-preserved historical cities, but it's also a stunning country with rocky islands, rolling hills and crystal clear coastal waters. On this fast paced trip entrances and guided tours of all the must-see ancient sites are included. Our trip begins in Athens. The city has been the capital of Greece for less than 200 years and is a heady mix of ancient and modern. It's part of the Plain of Attica, an area of amazingly varied scenery, from high mountains covered by pine forests to a stunningly beautiful coastline with a myriad of harbours. This evening you may choose to dine in one of the cafes in the colourful Psyrri district which offer, amongst other things, traditional Greek cuisine of scrumptious aubergines, tomatoes and cheese washed down with ouzo or raki or perhaps you'd prefer one of the great seafood restaurants near the harbour or to dine in a traditional and rustic taverna in the well known Plaka area at the foot of the Acropolis. This morning our Explore Leader will take us on an orientation walking tour of Athens going past the Parliament buildings, into the flea market, to see the River Eridanos and the hidden Roman ruins near Monastiraki metro station and to view the street art at Psirri. If time allows along the way we will stop by at the Art Foundation Bar. We'll also see the Anafiotika district, which looks and feels like a Greek island hidden to the north of the Acropolis. After exploring the city we head to the Acropolis itself for a guided tour. Here we discover the majestic ruins of the Athens of Pericles - the Propylaea (or marble entrance hall), the Parthenon (built by Ictinos 2,500 years ago), the Temple of Athena Nike (the Wingless Victory) and the monument most venerated by the ancient Athenians themselves, the Erechtheion. Legend has it that the gods Athena and Poseidon quarrelled here. The sea-god struck the rock with his trident, causing salt water to gush out, while Athena jabbed it with her spear and brought forth an olive tree. As olives were deemed to be more useful, the other gods let Athena take the city under her protection. The rest of the afternoon is free for you to discover more or there's the chance to visit the Panathenaic Stadium, which hosted the first modern Olympic Games in 1896. You'll notice the contrast between the modern capital and the old city - the well-heeled inhabitants of Kolonaki on the one hand, and the lively Plaka quarter on the other. You may choose to stroll around the shops, try the freshly caught fish or listen to bouzouki music in an outdoor cafe. You may like to walk up or take the funicular train to Likavitos, which affords great views across the city below. Today will be a busy day with a lot for us to see and do. We begin by driving to Piraeus where we board a catamaran ferry for the crossing to Poros Island. On arrival there will be time for you to grab a coffee before we begin our walk to the viewpoint over the island and coastline below. Our walk will take approximately one and a quarter hours and cover a distance of four kilometres with a maximum ascent/descent of 100 metres. Following our walk they'll be free time for you to take a swim near Kanali Beach and perhaps have a picnic lunch. Don't forget to bring your swimming suit and a towel with you. Next we take the short ferry crossing to Galatas back on the mainland and drive to Epidavros. Dedicated to Asclepius, the healing god and son of Apollo, the sanctuary here was one of the most important of the ancient world and it remained a site of pilgrimage until Roman times. It is home to one of the greatest and best preserved of all ancient Greek theatres. With its backdrop of rolling hills, this 14,000-seat arena merges perfectly into the landscape, so much so that it was only rediscovered and unearthed in the last century. The acoustics of the amphitheatre are so incredible that it's said that even those sat on the highest tier will hear a coin drop on stage. After exploring the site with a local guide, we will continue to Mycenae. The mighty ruins of ancient Mycenae are perched on a hilltop overlooking the modern city and are connected to the legend of King Agamemnon who commanded the 10-year long war against Troy. The site was unearthed in the 1870's and is prized for its Lion Gate and Royal Tombs. Equally impressive are the 'beehive tombs' which include the Treasury of Atreus - the lintel over the monumental Atreus door weighs over 120 tons! Homer's epithets of 'well-built Mycenae, rich in gold' are well born out in the superbly crafted gold and architecture of the tombs which can be seen in the museum. After our guided tour we'll drive on to Nafplion - the first capital of modern Greece and one of the most beautiful coastal towns in the Peloponnese. After checking-in to our hotel, our Explore Leader will take us on an orientation walk of this charming town including the first Greek parliament and fine examples of Byzantine and Venetian churches and buildings. Along the way we'll stop at a local cafe where we enjoy a tasting of local food specialities washed down with ouzo, which is a very popular local spirit flavoured with anise. This morning is free for you to relax and further explore Nafplion or you may like to rent a bike and cycle along the peninsulas coastline to Karathona Beach. The town is an ideal place for wandering with its maze of narrow streets, neoclassical mansions and harbour side cafes and bars. You may like to visit the Akronafplia Fortress. This afternoon we drive to Olympia with a quick photo stop at the incredible cyclopean fortress of Tiryns along the way. The ruined monuments of ancient Olympia are the birthplace of the Olympic Games and one of Greece's most renowned historical sites. The site lies in an enchanting valley setting close to the modern day town of Nea Olympia. The first monuments to be constructed were in the Altis (the sacred grove) and date back to the 10th - 9th century BC. Estimates indicate the games first began in 776 BC, after the worship of Zeus was established. Initially all the principal Greek cities took part in the Olympiads (which were held every four years). We'll be able to wander through the remains of the gymnasium, wrestling school, stadium and the Temple of Zeus. After our guided tour of the site we will check-in to our hotel. 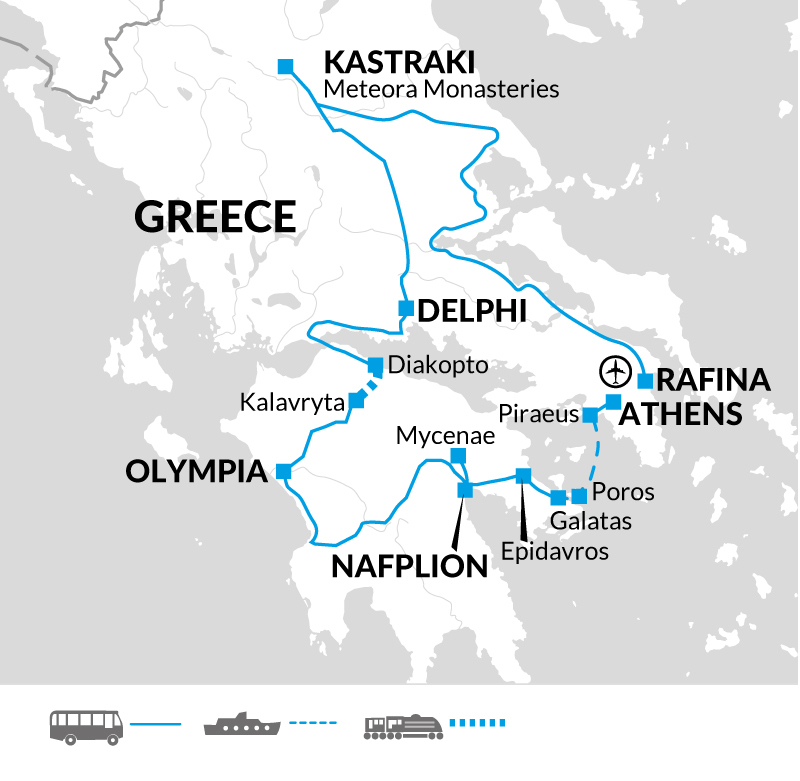 Please note that on some departures it might be necessary to visit Olympia on the morning of day five before taking a later train to Diakopto, due to the sites opening hours. We start today by driving to Kalavryta where we join the scenic Odontotos Rack Railway to Diakopto through the Vouraikos River Gorge. The railway was constructed over 100 years ago and takes us down from Kalavryta to Diakopto on the coast following the path of the river. It was designed to hide into the landscape without disturbing the natural beauty of the area it travels through and it does so remarkably well - hugging the gorges rock sides and traversing over a number of bridges. After admiring the fantastic views we'll drive on to the pretty red roofed town of Galaxidi on the coast where we have free time for an early dinner. We then continue our drive to Delphi where we check-in to our hotel and the rest of the evening is free for you to relax. This morning we take a sunrise walk along the ancient cobbled trail of Kaki Skala. The path has been used for over a thousand years and goes all the way to Corycian Cave, but we will only climb up the zig-zagged path as far as the view point overlooking the stadium at Delphi and admire the sunset from here. Our walk is a round trip of three kilometres with a maximum ascent/descent of 150 metres. Perched on the rocky slopes of sacred Mount Parnassos (2459 metres), Delphi was the perfect setting for mystery and religious prophecy. Here the god Apollo spoke through the medium of a priestess called the Pythia. The site's famous antiquities include the Temple of Apollo, a theatre, stadium and the Marmaria Sanctuary are all wonderfully picturesque. We'll have a guided walking tour of upper Delphi including the Temple of Apollo and visit the great archaeological museum where we can admire the Charioteer of Delphi statue and the Treasury of Siphnos ornately carved facade amongst many other items on display. We then drive to the peaceful village of Kastraki near the amazing Meteora Monasteries. The village is surrounded by towering rock faces on either side and the traditional houses make it a lovely spot for us to spend the afternoon. There is the option this afternoon to go on an easy round walk to the Great Meteoron Monastery and take in the fantastic views along the way, which will take us around two and a half hours and covers about seven kilometres. Today we will visit two of the six famous monasteries - Great Meteoron and Roussanou. Following our visits we will then walk past the scarcely visited Agia Triada Monastery to view it from the outside before walking back to Kastraki via a beautiful cobbled trail, this was once the only way between the monasteries and the valley. The Great Meteoron Monastery, as the name suggests, is the largest and also the oldest (built in the 14th century) and now houses a museum. Roussanou Monastery is more easily accessible as it sits on one of the lower rock towers. It is home to a small group of nuns whereas most of the other monasteries are inhabited by monks. After time to explore the monasteries, our Explore Leader will take us on a walk from Roussanou Monastery down a path to get a wonderful view back over the hilltop monasteries above. Our walk is five kilometres with a maximum ascent of 150 metres and descent of 350 metres and will take approximately one and a half hours. Following our visit we drive for around four and half hours to the seaside town of Rafina, arriving in the evening. The trip ends after breakfast at our hotel in Rafina, which is around 20 minutes' drive from Athens Airport. Athens: Panathenaic Stadium entrance €5.00 per person (€2.50 per person if 65 years old or above). Nafplion: Bicycle rental €10.00 per person per day. July and August are the hottest months, so lightweight cotton clothing is ideal. Earlier or later in the season it's best to be prepared for drops in temperature and the odd shower, so we recommend wearing layers and taking a lightweight raincoat and an umbrella. Women wearing trousers or shorts are not permitted to enter monasteries, so please bring a skirt and ensure your shoulders are covered. Comfortable walking shoes and sandals or trainers for relaxing. We recommend taking insect repellent, sunscreen, sunglasses, a sunhat, water bottle and torch. Most importantly don't forget your camera. Although entirely voluntary, tipping is a recognised part of life in this region of the world. Some local staff will look to members of the group for personal recognition of particular services provided. Accordingly you should allow approximately £15.00 for tips. This is no ordinary coach trip as we travel by rack railway through the Vouraikos River Gorge, take a catamaran ferry to Poros Island and enjoy numerous walks in both the cities and countryside, such as going to see Delphi Stadium at sunrise.